The first signs of weight related health problems began when I was pregnant with my son in 2000 and I was diagnosed with Gestational Diabetes, which appeared again a year later. By 2016 I was suffering from uncontrolled diabetes, chronic kidney disease, and sleep apnea. I was on an insulin pump for diabetes, receiving over 100 units of insulin throughout the day and adding more insulin with each meal. Trying to lose weight was an uphill battle as the insulin made it almost impossible to lose weight. In addition to chronic kidney disease, diabetes took a major toll on my kidneys over the years as my kidney function continued to decline. In July 2016 my nephrologist had a candid discussion with me. While he had encouraged me to consider Roux-en-Y gastric bypass on prior visits, this time he was very serious when he told me that it was now a matter of quality of life and referred me to Dr. Sanborn. In 2009, I considered weight loss surgery for the first time so I attended multiple seminars with various doctors over the following years, but was always very scared of the thought of having the surgery. After being referred to Erlanger, I attended the next seminar at the end of July 2016 and scheduled my consultation with Dr. Sanborn in August. I had heard many great things about Dr. Sanborn, read many testimonies and watched every YouTube video for Erlanger Bariatrics. I knew I had finally found the right surgeon for me. By November, I had completed my bloodwork which was the last step in completing all of my requirements for surgery. I received a call from Dr. Sanborn’s office to follow up with my PCP and nephrologist. I was devastated to learn that my kidneys were failing, as they were found to be functioning at 10% with the blood tests. I had to quickly switch gears and have weekly visits with my nephrologist, which ultimately led to having surgery to prepare for dialysis. At this point, I was taken off all meds which actually improved my kidney function a little, as I was getting dehydrated from the diuretics in my meds. 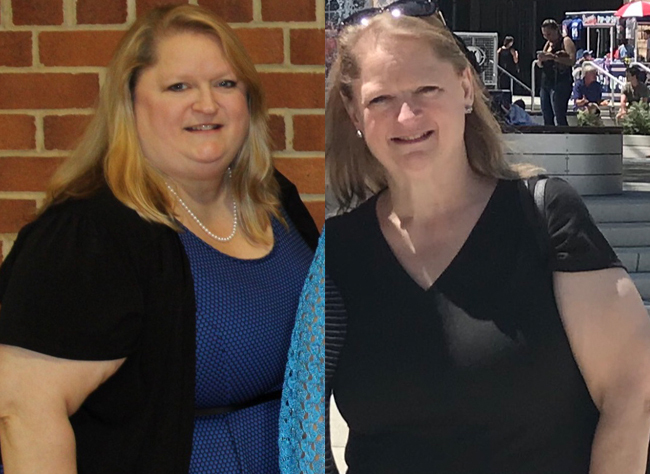 I continued to press on and was determined to have gastric bypass, however I had a couple more road blocks in my journey. In March 2017, I was admitted into the hospital after having excessively high blood pressure. A test revealed possible heart issues, which required me to follow up with a heart catheterization, a test which could put me straight into dialysis since my kidney function was so low. I was terrified and refused the test. While following up with my cardiologist, I learned that my bariatric surgery was approved. I was frustrated because my cardiologist was requiring me to have the heart catheterization before he would approve for me to have bariatric surgery. My health insurance case manager explained the heart catheterization process and urged me to have my nephrologist speak with my cardiologist. My nephrologist called my cardiologist while I was in his office to discuss the procedure. My nephrologist calmed my fears, encouraged me to go through with the heart catheterization, and assured me he would be there for my procedure. The heart catheterization went well, my heart was in great condition, and I was finally completely approved for bariatric surgery. I had surgery in June 2017, and within two months I was off the insulin pump and my kidney function began to improve. Within six months I was off all diabetes related medicines. A year later, I am down 130 lbs., my kidney function continues to improves, and I am no longer facing dialysis. In addition, my triglycerides are finally in normal range for the first time in over 10 years. This surgery truly saved my life and I am so grateful for Dr. Sanborn, his staff, and my entire healthcare team of doctors! Are you a future success story? Call our office at 423-778-2906 to sign up for a free seminar.